Home Forums Mechanical Turk Daily Work Threads 01/28 - Mozzarella Monday! Discussion in 'Daily Work Threads' started by jklmnop, Jan 27, 2019. Aerona, GoldenTemple, cyberwasp and 4 others like this. GoldenTemple, CrazyCatLady, Sondi and 4 others like this. keladry2009, cb456, GoldenTemple and 5 others like this. Aerona, scrmcasey, cb456 and 7 others like this. I did one. Can I stop now? CrazyCatLady, greg, GTR and 1 other person like this. CrazyCatLady, jklmnop, JenniLeigh and 1 other person like this. Turtlefemm, savvylabell, Despairagus and 4 others like this. Fine but I'm returning all the ones that are 9 pictures of patio umbrellas in the same color and they expect me to play "find the difference between these two pictures"
Srndpty and GTR like this. 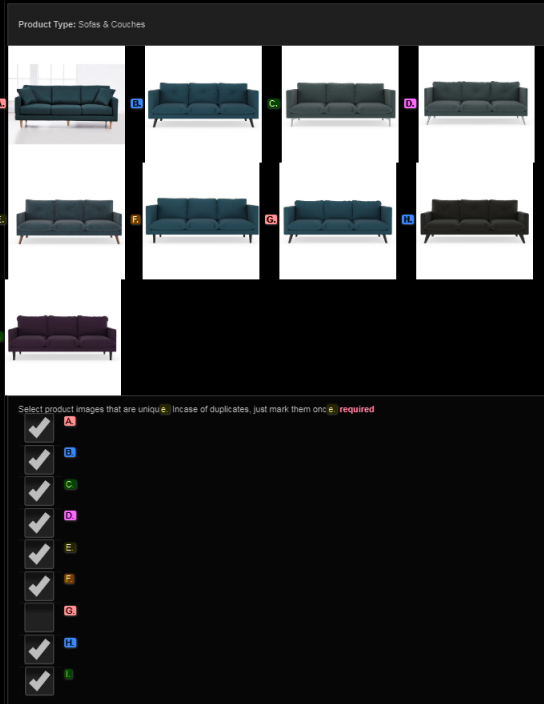 make it more challenging and do the one with 9 tiny tiny pics of sofa sectionals and look for the one slight difference. Long time, no see, @GTR. When you do one of your '80s movie parody posts, I'll be waiting in the shadows with my "Does this movie have a young, handsome, but morally corrupt James Spader in it?" comment. cb456, CrazyCatLady, jklmnop and 3 others like this. Srndpty, TotalBabe and GTR like this. you got an ez one i see. Like Less Than Zero James Spader? GTR and Starslip like this. How do I even qualify for those hits, or did I miss a qual that happened months ago? It's one of those that only do quals every once in a great while. Sorry, I try not to rub people's noses in closed qual stuff but some of these were just silly. CrazyCatLady, jklmnop and jan like this. It's worth periodically going through and request quals on HITs you don't currently qualify for. I do this about once a month or so, and I think it helps. You're never notified if the qual is granted, it just happens and new stuff starts showing up in your marketplace. DarkGifts, theturkscribe, jan and 1 other person like this.